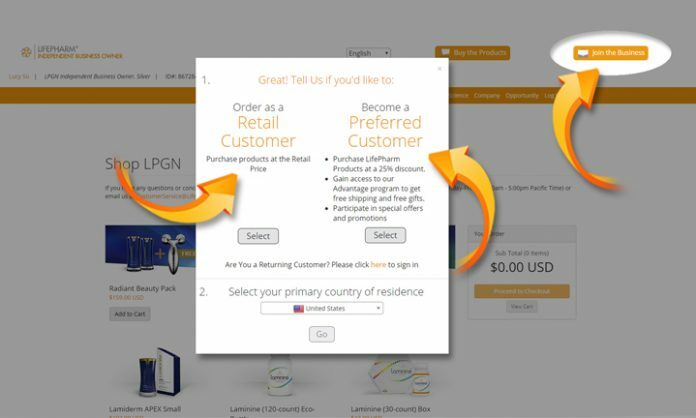 There are four ways to buy the product online. To place an order, please prepare your credit card and a working email address. Your order will be processed in 24-48 hours and delivery is from 3 to 10 working days, depending on the country. * No minimum order, fast check-out. * Choose this option if you plan to order again, buy product at member/wholesale price. * Virtual office is free, for the PRO version, you need to pay additional fees. Dormant accounts (six months or more) are automatically deactivated. You can register again at anytime. * As a member, you get discount in form of rebates when you enroll a new member under your account. STEP 5: Fill out information. STEP 6: Review order, submit, and pay. * Get discount in form of rebates when you add a new member under your account. * Rebates from US$4, $11, $60, $250 & up. * Rebates or bonus depends on rank & order. Wholesale price discount for members: Buy Laminine Eco-Bottle (equivalent to 4 bottles) at US$132 only instead of US$172. Sign-up now!